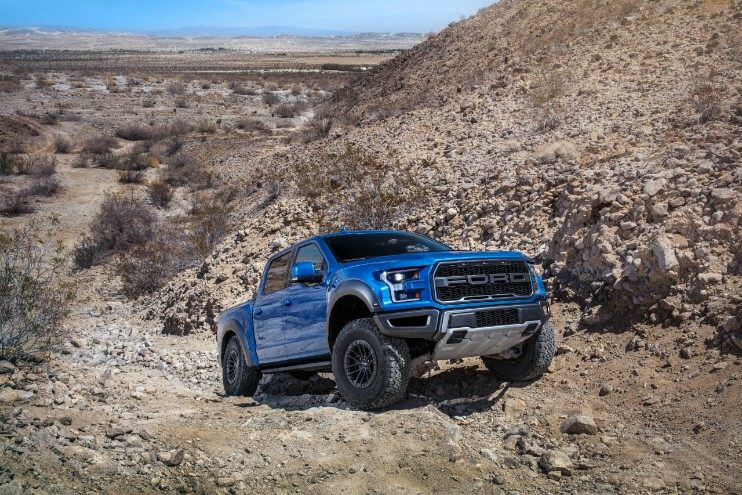 The Ford F-150 Raptor – Ford’s high-performance flagship off-roader from the best-selling F-Series line – has been revised and upgraded for the 2019 model year, gaining a brand-new “Trail Control” feature that can automate the throttle and brakes to keep the truck moving off-road. Ford characterizes Trail Control as being “like cruise control for off-road driving,” and that’s essentially just what it is, maintaining a constant speed (as best it can) over all sorts of terrain, and even intelligently, systematically using every trick in the book to get the truck unstuck when the going gets tough. The driver, not having to devote a large part of his or her concentration to manipulating the pedals and transmission, can focus more completely on steering through the trails. The 2019 Ford F-150 Raptor’s Trail Control feature can be operated at speeds from 1 to 20 mph, in all available 4×4 modes. Not only can it help dig the truck out should it get stuck in deep sand or mud, but it can also automatically help the Raptor scale steep obstacles, vectoring torque between each of the wheels as needed to help it ascend, and controlling the pickup’s descent by judiciously applying the brakes. The 2019 Ford F-150 Raptor, available from this fall, will continue to be powered by Ford’s racing-honed 3.5L EcoBoost V6, in this application serving up a stout 450 horsepower and 510 lb-ft of torque through a ten-speed automatic transmission with standard AWD/4WD. But unlike the powertrain, Ford’s new Trail Control feature won’t be exclusive to the Raptor. Instead, it will be made available on some models of the all-new, 2019 Ford Ranger midsize pickup, which arrives in dealerships early next year.